A portable SSD is already a better way to carry gigs of valuable data. The lack of moving parts means there’s less chance of the drive dying if it gets jostled, banged, or accidentally dropped. 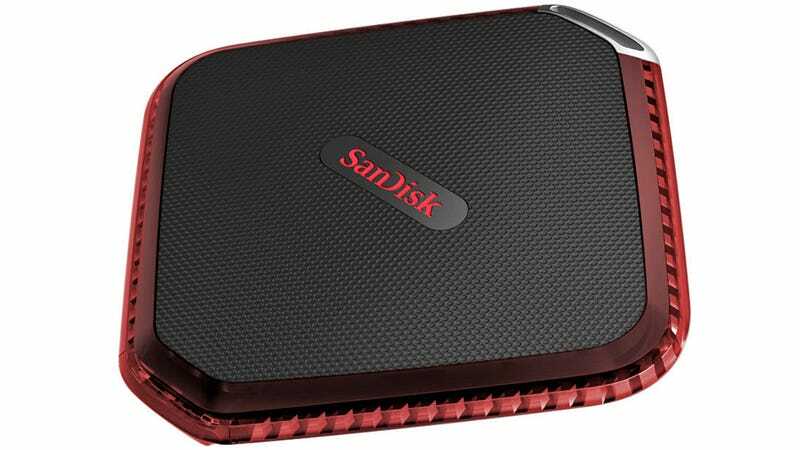 But your data’s even safer with SanDisk’s updated, rugged SSD that’s now wrapped in a shock, dust, and water-resistant bumper. The Extreme 510 Portable SSD is an update to SanDisk’s rubber-wrapped Extreme 500 Portable SSD that’s now IP55-rated for water and dust resistance. So you don’t have to be as paranoid about protecting 480GB of data when it starts to drizzle, or during a photoshoot on the beach when dust and sand is flying all around your gear. The solid-state drive also boasts transfer speeds up to 430MB per second based on the performance capabilities of your USB connection, which might help justify its $250 price tag if you’re thinking of upgrading.